Low cost by Dell. Dell presents an affordable business and office laptop called Vostro 2520. 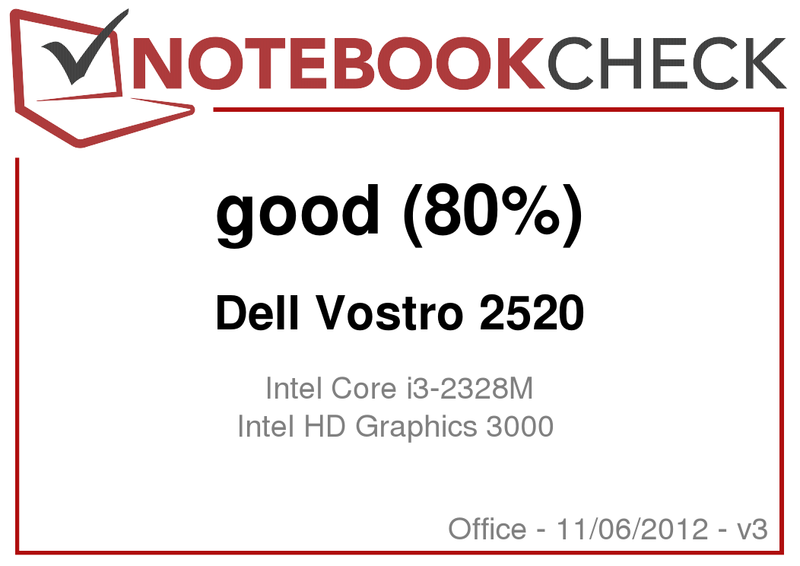 Our test report reveals whether a matte screen, Core i3 processor and long battery life make the Vostro 2520 a recommendable office laptop. Dell provides the Vostro 2520 range for frugal business customers. The models of this range cost less than the Vostro 3560 series laptops. The least expensive model of the 2520 range was available for 309 Euros (~$400) at the time of this review. However, it did not include a Windows operating system. 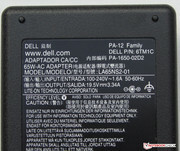 Dell sells a pre-configured version over the known internet shops or it can be customized in Dell's online shop. We tested a pre-configured model. The device we were provided with sports Intel's dual Core i3-2328M processor and its integrated Intel HD Graphics 3000 takes care of the graphics output. The system can fall back on 4 GB of working memory. Data is stored on a 500 GB hard drive. A DVD burner is also installed. We used HP's 650 (Intel Pentium B970, Intel HD Graphics (Sandy Bridge)) and Asus' Pro P53E-SO102X (Intel Core i3-2330M, Intel HD Graphics 3000) to classify the laptop. The Vostro 2520's casing is mainly made of plastic. 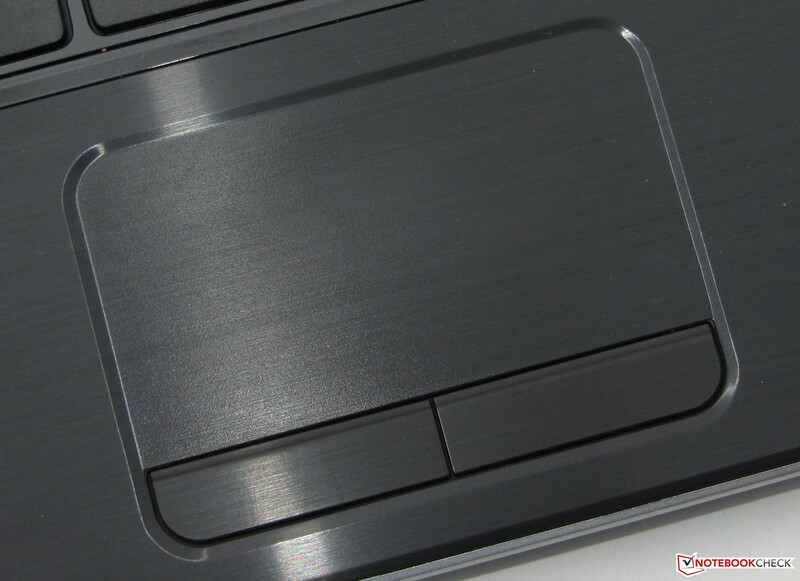 Only the base unit's top is metal and gives the laptop a much higher quality look. HP's 650 and Asus' Pro P53E-SO102X do not sport any metal parts. The Vostro 2520's casing features a dark, matte gray color, which Dell has dubbed "London Slate". The silver-gray plastic bezel that surrounds the base unit supplies a color contrast. Regrettably, Dell has decided to not completely rely on matte surfaces. The keyboard's bezel and the gaps between the keys are glossy and downright attract fingerprints. The base unit makes a robust impression. It only dents marginally under pressure. It yields more intensely when the casing is pressed in the keyboard's lower left area. The casing's stiffness is also acceptable in view of the price. It can only be warped slightly when held at its two front corners and produces a noise in that case. The Vostro 2520 does not have to fear a comparison with the Vostro 3560's casing. Nevertheless, the latter exhibits an overall more stable build. The lid's back is coated with a ribbed, rubber layer that protects the back from bumps and scratches. The lid is quite easily warped and its back can be dented without much effort. The hinges keep the lid firmly in position. It's not possible to open the lid with only one hand because the hinges are pulled too tight. Dell's Vostro 2520 cannot stick out from HP's 650 and Asus' Pro P53E-SO102X in terms of connectivity. None of the laptops sport a USB 3.0 port. If you value an ExpressCard slot and also need USB 3.0, you should look closer at the "bigger" Vostro 3560 model. The memory card reader (SD, MMC, Memory Stick) is on the front. 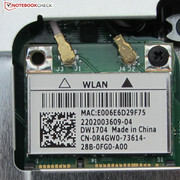 The Vostro 2520 harbors Dell's own Wi-Fi module, Dell 1704. 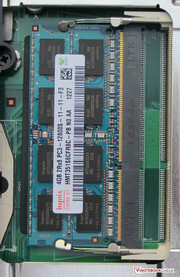 A Broadcom chip operates on the module. It supports the 802.11 b/g/n Wi-Fi standards and also supplies the laptop with Bluetooth 4.0. An old acquaintance known from many laptops provides cabled network connections: a gigabit Ethernet chip from Realtek's RTL8168/8111 family. A webcam is installed in the display bezel. Dell does not include any accessories apart from a few manuals and quick start posters. Our test device is delivered with Ubuntu Linux 11.10 preinstalled. 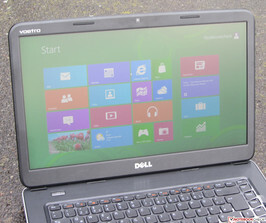 If you buy the Vostro 2520 directly from Dell, you can configure it with either Windows 7 or Windows 8. We installed Windows 7 for our tests. The necessary drivers can be downloaded from Dell's website. We could install Microsoft's latest Windows 8 version on the laptop without problems; it detected almost all hardware immediately. 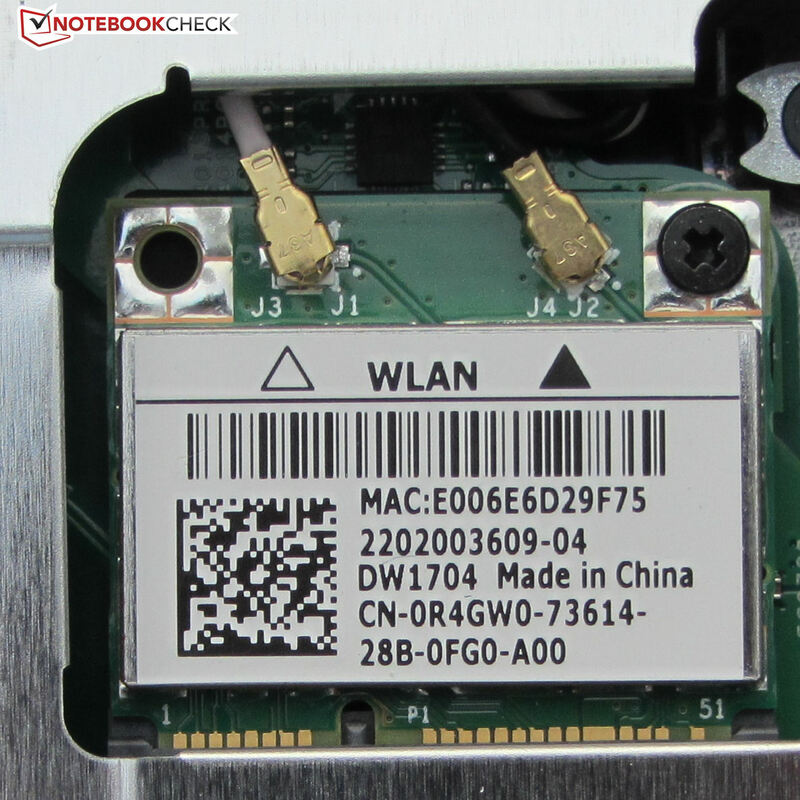 Windows 8 did not provide drivers for the Wi-Fi/Bluetooth module - but Windows 7 did not either. If you are planning to install Windows 7/8 on the laptop and are connected to the DSL router via Wi-Fi, you should first download the corresponding drivers from Dell's website. The Vostro 2520 does not prove to be particularly maintenance-friendly. All components in the laptop are basically accessible. However, accessing them is quite tedious and very inconvenient. There is no maintenance cover. The keyboard has to be removed by pressing four snap-fit hooks toward the display in order to access the working memory and Wi-Fi module. The procedure is not easy because the hooks always recoil. The hooks can be pressed with a flathead screwdriver. However, there is always a risk of scratching the case. The laptop sports two working memory banks. Our test device sports a 4 GB module. Contrary to the specs on Dell's website, the laptop supports a maximum of 8 GB RAM and not only 4 GB. We tried it out. The base unit's entire top has to be disassembled if the laptop's hard drive is to be replaced. Replacing the hard drive is easy. However, Dell installs hard drives with a height of 7 mm in the Vostro 2520. Conventional hard drives have a height of 9.5 mm. If you want to exchange the hard drive, you should download the Vostro 2520's manual with exact instructions on replacing the hard drive. A 24 month collect and return warranty is included with our test device. The laptop is picked up from and returned to the customer in a warranty case. In contrast, HP's 650 only includes a 12 month warranty. Note: when the Vostro 2520 is bought directly from Dell, it standardly only includes a 12 month warranty. 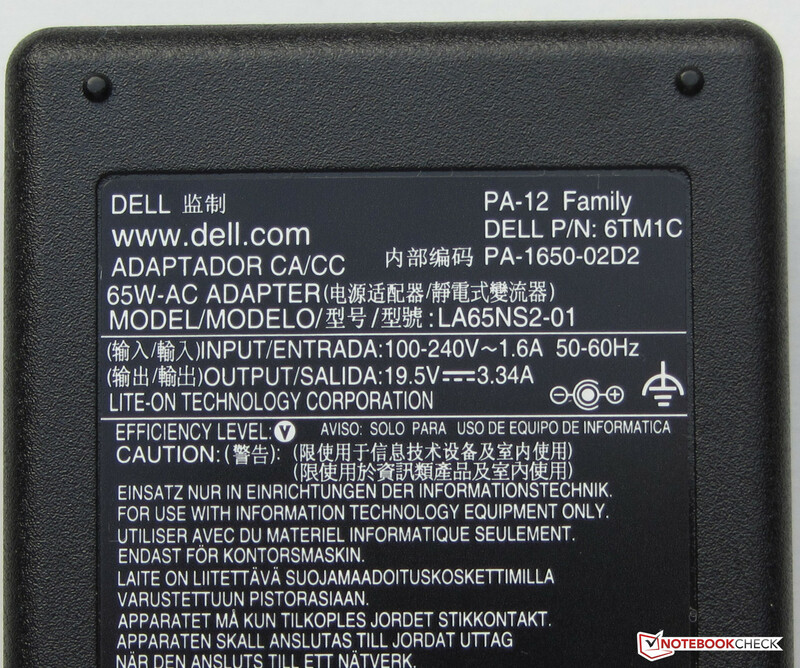 The warranty on Dell's laptops can be upgraded. For example, a three year on-site warranty including ProSupport costs 120 Euros (~$155). 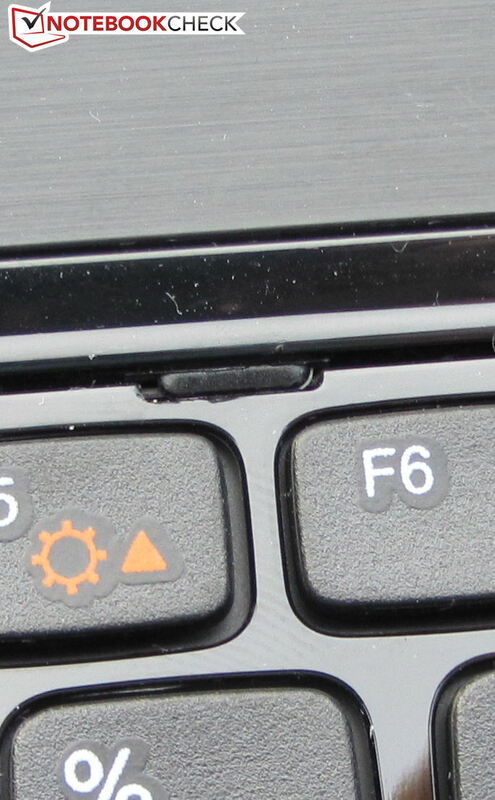 Dell installs a chiclet keyboard in the Vostro 2520 which we already know from other laptops, such as the Vostro 3560. The main keys feature a size of approx. 14 x 14 mm. The keys could have been one millimeter wider and deeper; enough room would have been available since Dell did not install a number pad. The keys exhibit a sufficient drop and a clear pressure point. The keyboard recoils a bit while typing. This effect is more intense in the keyboard's center than at the sides. The Vostro 2520's keyboard is defeated by the one in Asus' Pro P53E-SO102X. The touchpad presents a size of 9.1 x 4.9 cm. The sleek surface allows the finger to glide pleasantly. The touchpad supports multi-touch gestures and functions like pinch-to-zoom are available. All gestures can be enabled or disabled in the touchpad's configuration menu. Two mouse buttons are positioned below the pad and feature a medium drop as well as a clear pressure point. As is common for low-cost 15.6-inch laptops, an LED backlit screen with a native resolution of 1366x768 pixels is installed in the Vostro 2520. The matte surface reinforces the laptop's business claim. Both HP's 650 and Asus' Pro P53E-SO102X also sport such a screen. 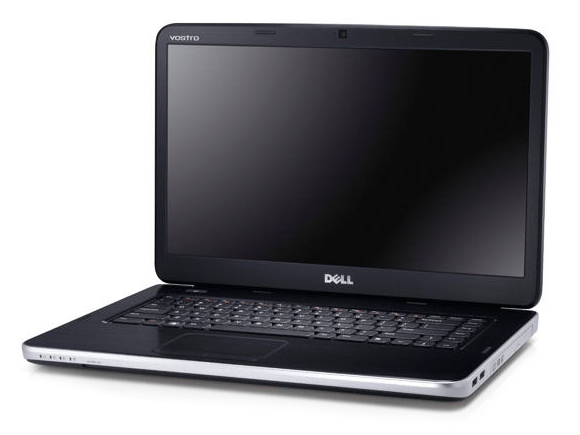 Other screen models are not available for either Dell's laptop or the two contending models. The average brightness of 237.8 cd/m² is within a good range. HP's 650 (167.7 cd/m²) and Asus' Pro P53-SO102X (165.2 cd/m²) lag far behind the Vostro 2520. The screen's black value of 0.84 cd/m² is in the upper midfield and its contrast ratio of 304:1 is decent. 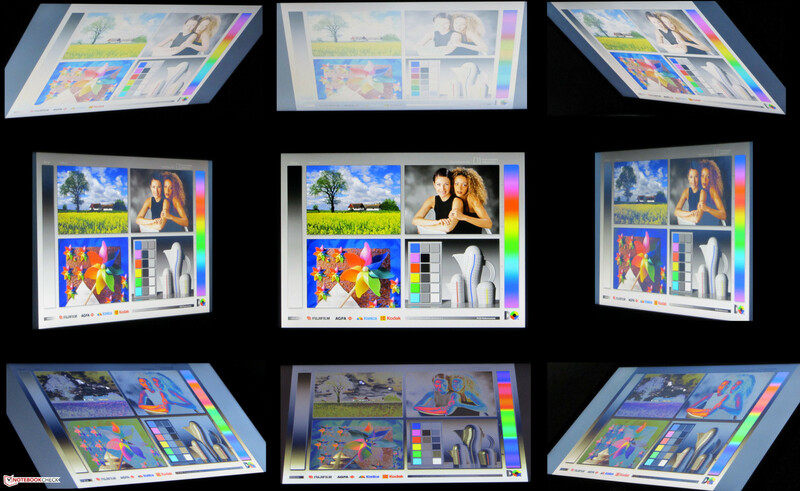 The screen does not cover either the sRGB or AdobeRGB color spectrum. Attentive readers will notice that the Vostro 2520's black value and contrast ratio are superior to that of HP's 650, although both laptops likely sport the same screen according to the label. We measured the screen in Dell's laptop with another meter than used on HP's 650. Beyond that, possible manufacturing tolerances of identical screens also have to be considered. The screen's brightness is easily enough for outdoor use. Its matte surface also makes things easier. The viewing angle of the Vostro 2520 correlates to the price range and is on a par with HP's 650 and Asus' Pro P53E-SO102X. Changing the vertical viewing angle quickly leads to image distortions. In return, the horizontal viewing angles are more generous. Dell supplies a range of affordable office devices for business customers and private users with the Vostro 2520 series. Our test device provides more than enough power for routine computer use, i.e. word processing, internet communication, video rendering. At the time of this review, our test device was listed at 399 Euros (~$517). The low-end device was price-tagged with 309 Euros (~$400) and was powered by Intel's Celeron B820 processor, featured 2 GB of working memory and a 320 GB hard drive. 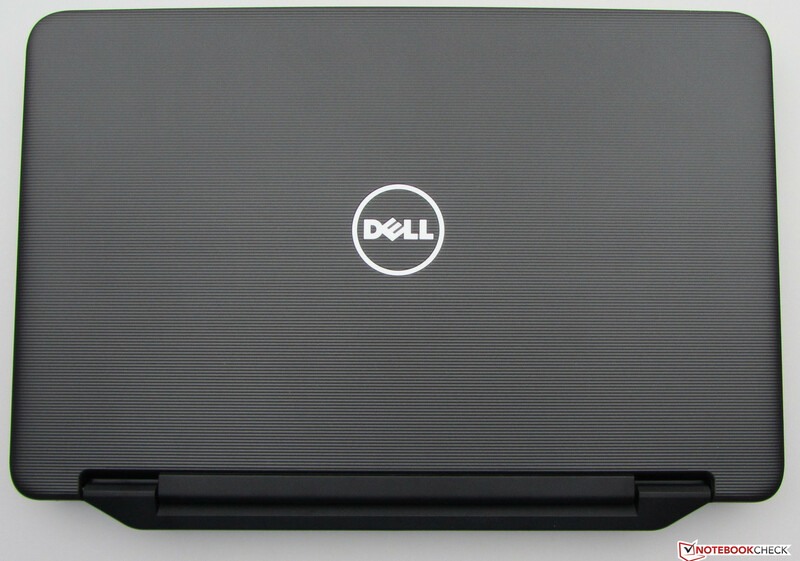 If you buy the laptop in Dell's online shop, you can also opt for Windows 7 or 8 and Intel's Core i5-3210M processor. Our test device is powered by Intel's Core i3-2328M processor. It is a new CPU that comes from Intel's previous Sandy Bridge processor generation. The CPU clocks with 2.2 GHz. The Core i3 does not feature Turbo. The Core i3-2328M is identical to the Core i3-2330M with one difference: the Core i3-2328M does not support Intel's Small Business Advantage Tools. That is a collection of utilities from Intel for the business field and, for example, enables locking the computer's USB ports. The CPU finished our stress test (Prime95 and Furmark run simultaneously) at full speed (2.2 GHz) in AC mode. The GPU mostly clocked at its maximum of 1100 MHz. It was sometimes downclocked to 1050 MHz. The CPU also clocks at full speed on battery power, but the GPU's clock is reduced to 650 MHz. The Cinebench tests were also completed at full speed. The test scores are on the expected level. The Pentium B970 in HP's 650 is clearly surpassed. Asus' Pro P53E-SO102X (Intel Core i3-2330M, Intel HD Graphics 3000) is the clear winner of Cinebench 10's GL tests. Surprisingly, it is clearly defeated by the Vostro 2520 in Cinebench R11.5's GL test. We presume that it is due to the newer driver of Dell's laptop. 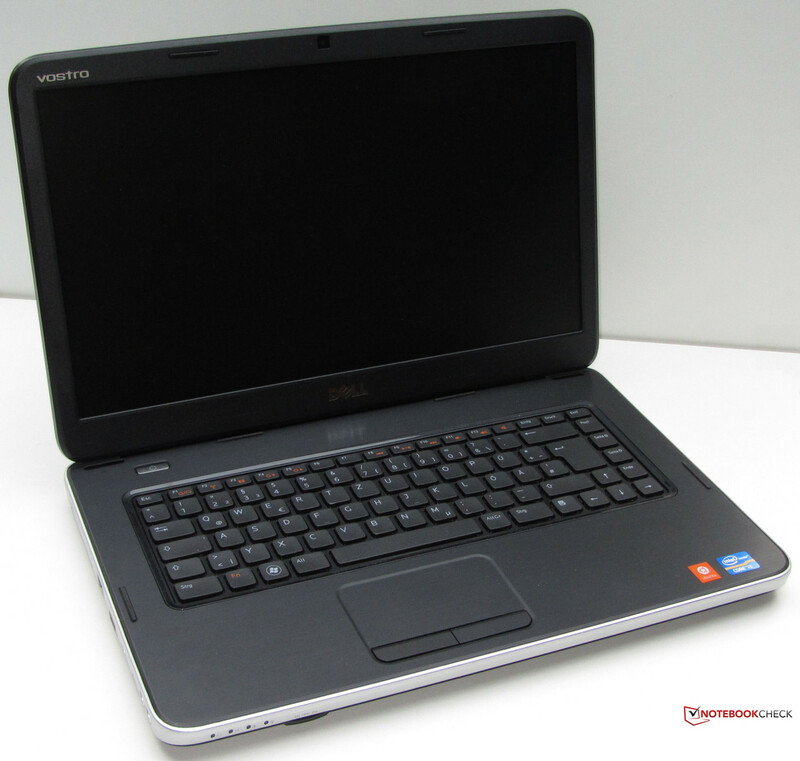 The laptop runs quickly and smoothly on Windows 7, Windows 8 and Ubuntu Linux. 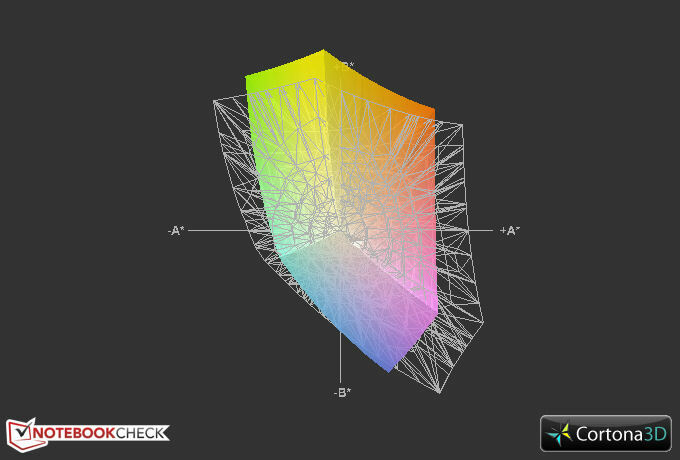 The PCMark test results are on the expected level. Both HP's 650 (Intel Pentium B970, Intel HD Graphics (Sandy Bridge)) and Asus' Pro P53E-SO102X (Intel Core i3-2330, Intel HD Graphics 3000) are defeated. We believe this is due to the Vostro 2520's swifter hard drive. Dell equips our test device with a hard drive from Seagate's Momentus Thin series. The drive features a memory capacity of 500 GB and spins with a speed of 5400 rpm. The measurements of the hard drive surprised us pleasantly because we did not expect such rates from a laptop of this price range. CrystalDiskMark recorded a read time of 100.5 MB/s. HDTune ascertained an average transfer rate of 82.2 MB/s. Both rates are good for a 5400 rpm drive. 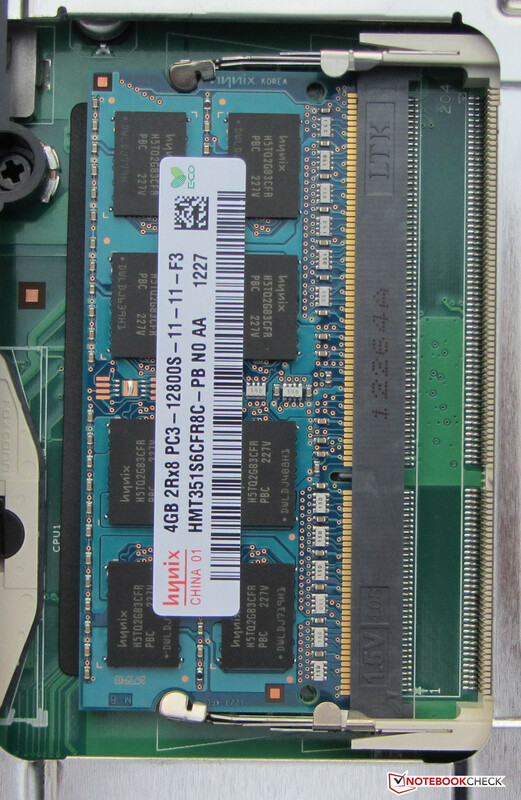 We usually determine rates between 60 and 70 MB/s in low-end laptops. The graphics solution in the Vostro also comes from Intel. It is the Intel HD Graphics 3000 GPU, which clocks from 650 to 1100 MHz and supports DirectX 10.1. The results of the 3DMark benchmarks are on the expected level. HP's 650 (Intel Pentium B970, Intel HD Graphics (Sandy Bridge)) is clearly surpassed. Dell's laptop again has the lead on Asus' Pro P53E-SO102X (Intel Core i3-2330M, Intel HD Graphics 3000). Again, we believe the newer graphics drivers of Dell's laptops are responsible for this. The Vostro 2520 is not designed for professional computer gamers. The hardware is at most enough for low resolutions and low quality settings. However undemanding games, such as the FIFA series, still run smoothly even in higher quality levels on Dell's laptop. The Vostro produced a noise ranging from 30.3 to 34.1 dB in idle. The rates are acceptable, but not exceptional. We have tested budget laptops that operate less noisily - for example, HP's Compaq Presario CQ58-148SG and Lenovo's IdeaPad N581. The noise increased to 36.2 dB when the DVD drive in Dell's laptop was used. It really got loud when the laptop was put under full load. We ascertained a noise of 45.9 dB in the stress test (Furmark and Prime95 run simultaneously). A rate of 41.3 dB was reached in medium load (3DMark 06). We did not discover an immoderate temperature development on the casing. The laptop reached temperatures between 25 and 33 °C on both the top and bottom in idle. 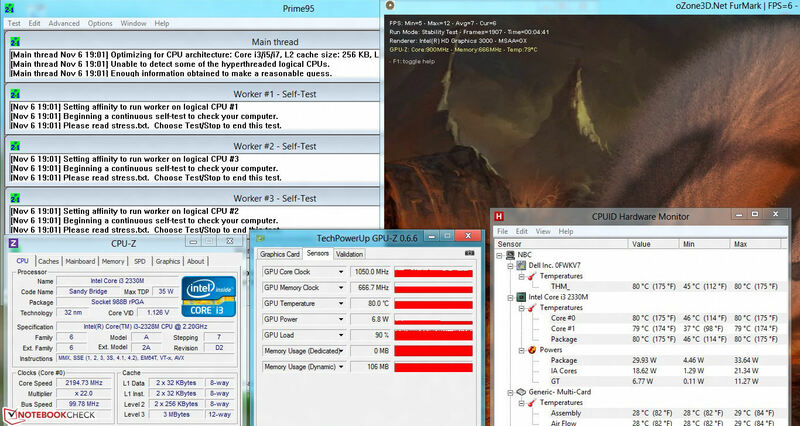 The temperatures climbed to rates between 23 and 39.8 °C during full load (Prime95 and Furmark run simultaneously). The temperature on the wrist rest always remained below 30 °C and allowed comfortable working. The CPU always clocked at maximum speed during the stress test (Prime95 and Furmark run simultaneously for at least one hour). The GPU ran with 1050 to 1100 MHz in AC mode; it clocked with 650 MHz on battery power. The CPU's temperature settled to approx. 80 °C. (+) The average temperature for the upper side under maximal load is 27.6 °C / 82 F, compared to the average of 29.4 °C / 85 F for the devices in the class Office. (+) The maximum temperature on the upper side is 39.2 °C / 103 F, compared to the average of 33.9 °C / 93 F, ranging from 21.2 to 62.5 °C for the class Office. (+) In idle usage, the average temperature for the upper side is 27 °C / 81 F, compared to the device average of 29.4 °C / 85 F.
(+) The palmrests and touchpad are cooler than skin temperature with a maximum of 27.9 °C / 82.2 F and are therefore cool to the touch. (±) The average temperature of the palmrest area of similar devices was 28.2 °C / 82.8 F (+0.3 °C / 0.6 F). 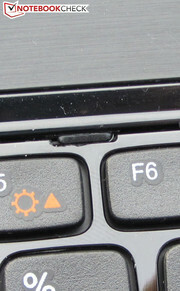 Both stereo speakers in the Vostro 2520 are located far above the keyboard. The sound does not stick out of the mass of other laptop speakers and is adequate for an office device. They tend to sound tinny. If the sound does not satisfy you, you can always connect external speakers or headphones to the device. The Vostro 2520 consumed 6.8 to 13.2 watts in idle mode. Dell clearly undercuts Asus' Pro P53E-SO102X (10.2 to 15.3 watts) with these rates. HP's 650 is defeated marginally in the minimum power consumption (9.3 watts). Surprisingly, the Vostro proved to be much power hungrier than Asus' laptop during the stress test (Prime95 and Furmark run simultaneously). Although both laptops are virtually identical technically, Dell's device consumes 52 watts, a whole 10 watts more than Asus' laptop. The power consumption of HP's 650 ranges between the two other laptops with 47.5 watts. 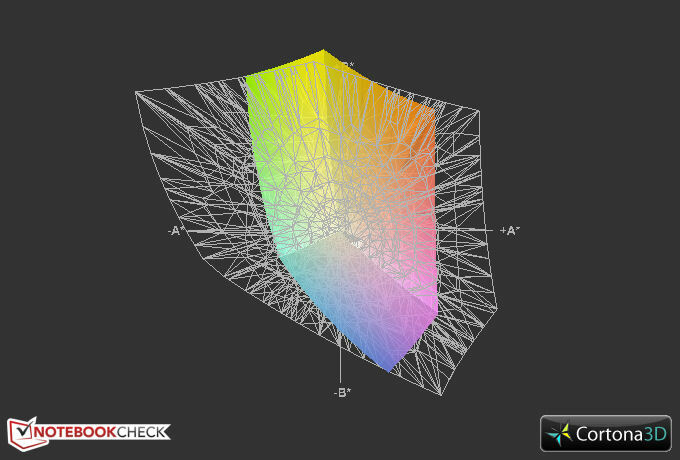 It does not look much better for the Vostro 2520 in medium load (3DMark 06). With a power consumption of 40 watts, it consumes 5.9 watts less than Asus' device. HP's 650 (31.6 watts) outdoes both contenders. The Vostro 2520 achieved a runtime of 8:27 h in idle (HP 650: 6:32 h; Asus: 8:55 h). 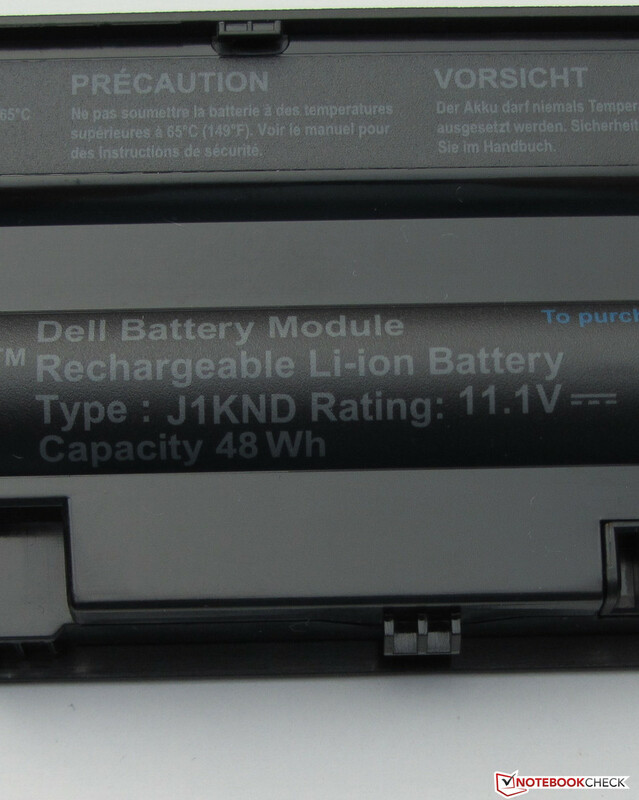 We use Battery Eater's Reader's test to simulate idle mode, i.e. the screen is set to minimum brightness, the energy savings profile is enabled and the Wi-Fi modules (WLAN, Bluetooth) are off. The Vostro managed a runtime of 1:33 h in load (HP 650: 1:17 h; Asus: 1:49 h). 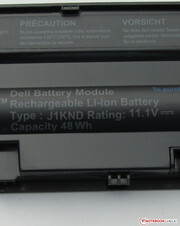 Battery Eater's Classic test is used for the load test. For this, we set the screen to maximum brightness, enable the high-performance profile and wireless modules. 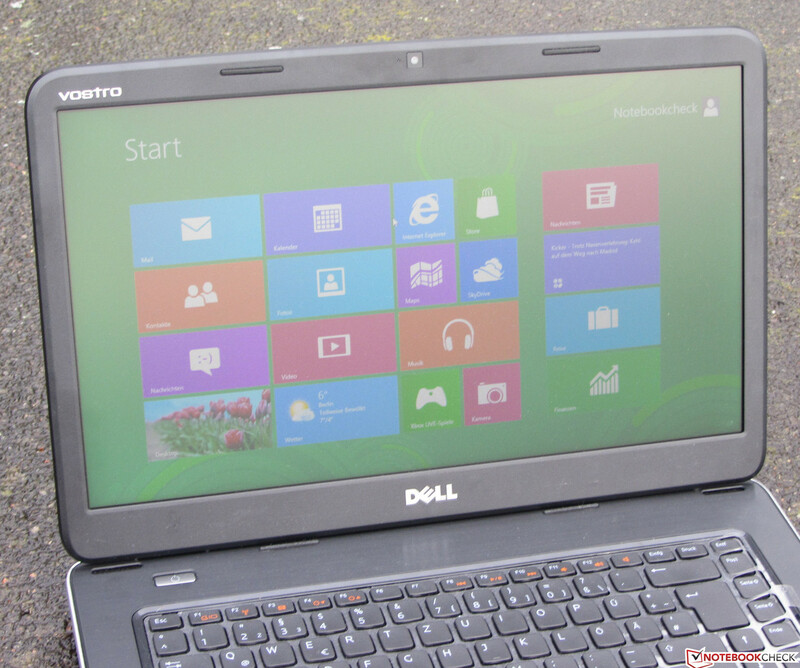 Dell's notebook lasted for 5:24 h in the Wi-Fi test (HP 650: 4:44 h; Asus: 4:12 h). Websites are automatically opened every 40 seconds by a script in this test. Energy saving mode is enabled and the screen's brightness is set to approximately 150 cd/m². If you are looking for a laptop to regularly watch DVDs, the Vostro 2520 will not disappoint you. One battery charge was enough for playing DVDs for 5:10 h (HP: 4:01; Asus: 4:05 h). The screen is set to maximum brightness, energy savings mode or a higher profile (should the DVD not run smoothly) is used and the wireless modules are off. Dell has to be praised for the battery runtimes. The company extracts much longer times from the Vostro 2520 in the realistic Wi-Fi and DVD tests than Asus or HP do. 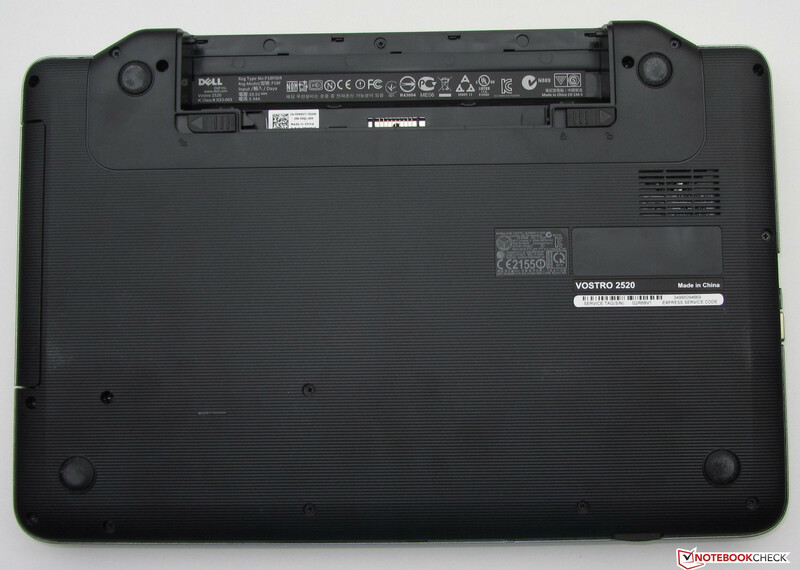 Particularly since Asus's laptop sports a higher capacity battery (Asus: 56 Wh, Dell 48 Wh, HP 47 Wh). The advantages of Dell's Vostro 2520 are found in the good battery life, decent application performance, 24 month warranty and matte screen. The screen's contrast, black value and brightness are more than acceptable for the laptop's price range. The device can easily cope with routine application scenarios and provides more than enough power for most computer users. Regrettably, Dell has not placed much value on good maintenance. The entire laptop has to be disassembled to exchange the hard drive or clean the fan. The Vostro 2520 could also be a touch less noisy. It is an office laptop and you would want a quiet surrounding here. Users who put value on low noise development should look closer at HP's 650. It produces less noise over the entire load range. The advantage of Asus' P53E-SO102X over the Vostro 2520 is the superior keyboard including number pad. The DVD drive reads and writes on all kinds of DVDs and CDs. The PSU weighs 249.5 grams. and supplies a capacity of 48 Wh. The battery weighs 308 grams. Our test device was delivered with Ubuntu Linux. There are no other buttons apart from the power switch. Good: the laptop sports two Wi-Fi antennas. The notebook has two RAM banks. the hooks have to be pressed toward the back. and supplies a maximum power of 65 watts. A 24 month warranty period is rather unusual for this price range. USB 3.0 and an easier way to replace the hard drive. The Vostro 2520 offers good battery runtimes despite its low price.